The second installment to The Monthly Announcement! Welcome to yet another Monthly Announcement! 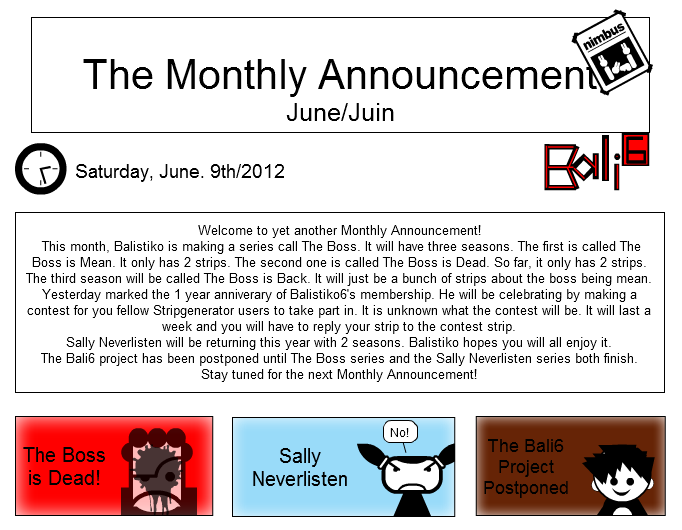 This month, Balistiko is making a series call The Boss. It will have three seasons. The first is called The Boss is Mean. It only has 2 strips. The second one is called The Boss is Dead. So far, it only has 2 strips. The third season will be called The Boss is Back. It will just be a bunch of strips about the boss being mean. Yesterday marked the 1 year anniverary of Balistiko6's membership. He will be celebrating by making a contest for you fellow Stripgenerator users to take part in. It is unknown what the contest will be. It will last a week and you will have to reply your strip to the contest strip. Sally Neverlisten will be returning this year with 2 seasons. Balistiko hopes you will all enjoy it. The Bali6 project has been postponed until The Boss series and the Sally Neverlisten series both finish. Stay tuned for the next Monthly Announcement! May I also use the idea?